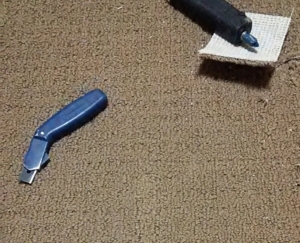 Carpet Repair is what we do! The science of carpet repair is similar to a surgeon, without all the blood and guts and anesthesia. We are highly trained professionals with a rare skill craft, in which no two jobs are exactly the same. We take a scientific approach to assessing the carpet fiber type, with special attention to how the fibers are woven, and what the best procedures are to achieve the best possible outcome. Carpet repair is the most cost-effective alternative to carpet replacement. You will likely save 60%-75% of the cost of replacing with new carpet by having The Carpet Chemist repair it; which means you won’t have to turn your house upside down and rearrange your schedule or take a second mortgage out on your home because “Patches” got scared during a thunderstorm and dug a hole in the carpet. STEP 2. UPLOAD pic of your carpet ‘areas of concern’ to the UPLOAD ATTACHMENT below.